Recent posts have taken an Arty turn, so I thought I might throw in one more so that you can see that no matter how much of a beginner you may be, anything is possible if you are willing to learn. Himself and I have been helping a friend get through a difficult domestic situation in recent years and since she has no money, but was unhappy that I would do this for free, so we worked out that in return she helps me around the house with tasks I can not manage. When she has appointments (lawyer etc) and it not appropriate for her young daughter (“M”) to be present, I look after “M” after school. “M” is six years old and was always asking to draw something so we arranged that in return for this help, I would fill some of these babysitting occasions with simple drawing lessons. I am by no means a qualified teacher, so I had to get help from the internet on the topics that my young student choose: cats, bunnies, flowers, Space (I found a rocket, which was approved) … and other things like horses, which she will have to work up to later when she is older since they represent a way too difficult level for her at this stage. I bought her a small, cheap book that has blank pages, a larger one for me and we got to work. 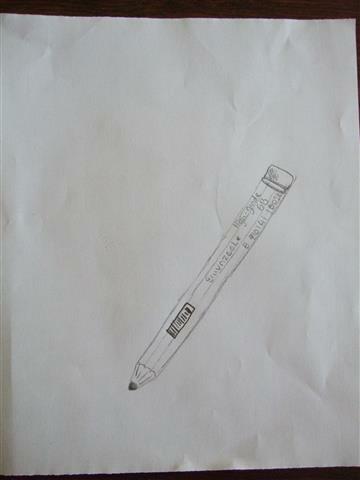 We start with learning to draw circles and ovals as softly as we can with an HB or 2B pencil. We make a hard lined circle in her book and put a sad face next to it when we try and rub part of it out, but part of the line still shows, and a happy face next to the one we did softly that disappeared when partly rubbed out. Leaving space for some practice exercises we draw more circles, I first go over what we will draw, step by step in my book, then repeat again in her book as that she can refer to it at home. 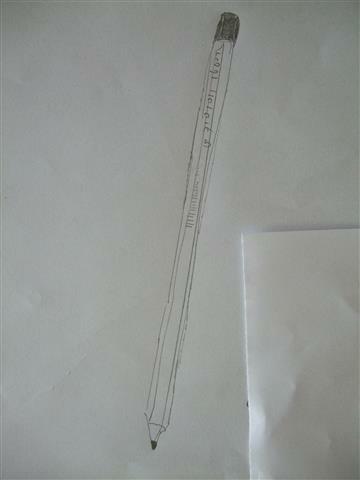 Then she has to try and replicate the drawing at home. Since she is very young and I do not want her to get frustrated, feel like she failed, and want to give up, I draw guide circles into her book to help with her home efforts. 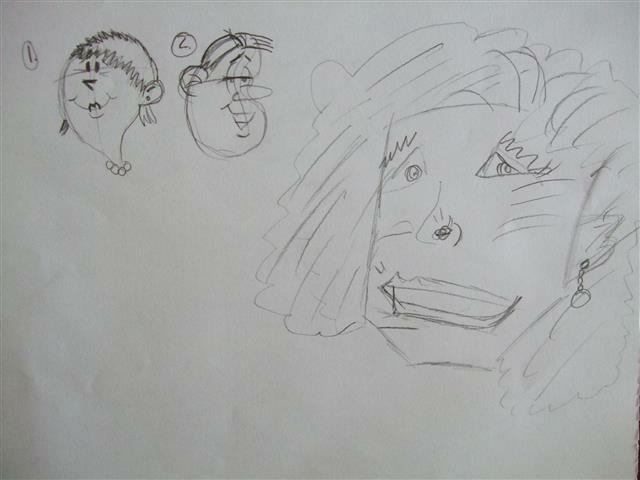 Luckily I found some good examples on the internet to start her off on her chosen topics and we begin to draw. Of course she has major difficulty to replicate the image at this age without my guide lines but the idea is to have fun and not gaining perfection. Since these are not paid lessons and we only babysit when needed, sometimes quite a few weeks goes by between our sessions, so I want to try and keep her interest over time. I wrote her and my name on some of the pages so in the interest in privacy for us both I have edited this out of several of the photographs. We aim to keep going whenever the occasion arises and it will be interesting to see where, for each of us, this little arty exercise might lead. I’m continuing with the arty theme of the past two days with a post about “long, long ago”. 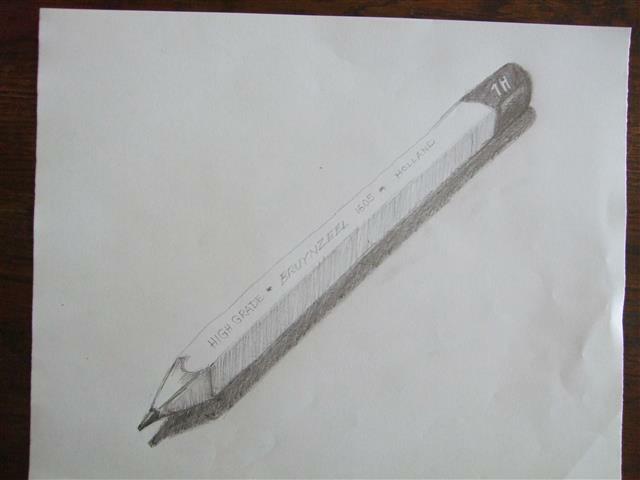 When I was sixteen and studying practical art, we could choose between two areas for our exam portfolios. One area was “General” and involved things like life drawing, still life, sculpture, photography (and other things that I now forget) and the other branch was “Graphic Design” where various mediums were explored to complete packaging designs, posters and advertisements, gift wrap (and other things that I now forget… it was a while ago after all and my memory is muddled with medication). The added bonus, at least in the design course was that you could choose to specialise in a specific genre to achieve these tasks, and I choose Printmaking. During the course I did lithographic and intaglio printing techniques which encompassed; woodcuts, linocuts, screen printing, lithographs and etchings. In later years whilst I travelled I put my things in a storage facility, a change of manager of which saw most of my things (and those of the other clients), and the manager in charge of it all go walk-a-bout (missing). Back in 1996 when Himself and I were back in New Zealand and had our first opportunity to see the communal pile of what had been left behind, I found by chance a small lone folder containing a few pieces of my artwork, everything else in my larger folders having completely disappeared. We found one tray and almost nothing else of all of my possessions. I bought these few art pieces back to the Netherlands and dug them out earlier this year. These were the first of a series of etchings, the first that helped me become familiar with the techniques. I was shocked when Kiwi Daughter did an “etching” at school, yes, I suppose it was in the letter of the word but in my eyes not in the spirit of it. She showed me a perspex sheet into which she had scratched lines with a needle: gone was the zink plate, gone was the “ground” which was a concoction of all sorts of things, including petrol, gone was the acid and the feathers used in the acid baths to pick up the plates and gone were many of the ‘old school” minae that to me make up real etching. I was shown the correct handling techniques, and a grave respect for the materials and machinery we were using was drummed into us. It’s like keeping sharp knives: teach respect for them and your kids can learn to use them at a surprisingly young age. This etching was done with a zink plate and the final print is a compilation of four passes through the printing press. The first pass is a light print of the drawn/scratched image into the ground which is then etched in the acid. The acid eats into the area exposed, the ink later collects into these etched scratches and is drawn back out onto paper under the pressure of the printing press rollers. Ground is then applied to the plate and more drawing / scratching takes place, cross-hatching and the like. A second round of etching and printing and darker areas are applied in areas where shadows etc are wanted. The third stage is a Mezzotint effect, not using the rocker technique (I did that later) here but another one where a bag of powdered resin was gently shaken over the plate resulting in grains of various sizes falling down and shielding it from the third etch. Solid areas that were not to be mezzo’ed were painted out with ground. The resulting third print gives texture, in this case to the bricks. The last etch and pass through the printing press is another one for the darkened areas, putting in the final touches like the mortar between the bricks and shadows around the windows. That is at least everything I remember, of course some of the extra details have gone. This is the only remaining art piece from my teens, everything thereafter is gone but it gives you a tiny idea of the detail I used love. It’s what I aspire to one day get back to, if at least we can get my pain levels back to manageable levels and concentration can return. I can at least dream about the distant past. Yesterday’s post about fellow blogger Maureen’s beginning exploration into watercolours has set me off on a tangent. Most of my efforts to get back into drawing have failed, it never seems to be the right moment: I am too tired, I don’t have a sketchbook to hand at the right time, or I can’t concentrate, nothing goes right. On the very few occasions I do manage to draw something I am frustrated that I can’t transfer the image in my head onto the paper. I know how I want the end result to look like, but achieving it is another story completely. What makes it worse is that until my early twenties creativity seemed to flow from the tips of my fingers like water. When I sat to sketch I could put what I saw before me onto paper, the end results may not have always been exactly perfect (which artist is truly satisfied with their work?) but drawing, printing and painting were times of relaxation and fun, and not the exercises in frustration that they are now. Well, I travelled, I worked as a low paid temp which meant time but no money, I studied, more time, no money. Then I got a permanent job, travelled and then had kids, so had the money but no time. Then came the accident, no concentration, a lot of frustration and trying not to fall asleep over a sketchbook. I know that after decades away from drawing it will take more than a few sketches to get back into the swing of things, but I’m impatient. I’m beginning with doodles and quick studies. That way it’s a short burst of concentration and I can tell myself that since it isn’t a real drawing yet that it doesn’t matter if it looks well, as my kids would say … sketchy. With Halloween just around the corner maybe it’s fitting to say that I hope these will haunt me and spook me into doing more to get out of the drawing doldrums. A Golden Coach… Sort of. “In 1977 (Dutch artist) Rien took part in the parade next to the Golden Coach with Prince’s Day. He opened the door of the golden carriage at the Ridderzaal to help Queen Juliana, Prince Bernhard, Princess Beatrix and Prince Claus out of the carriage. He was already fascinated by this ceremony and the knowledge that he was going to do this caused him a lot of sleepless night!” This sand sculpture comes in two parts: the first being the intricate coach and the horses that pull it. It’s the evening that Little Mr. is away from home for a sleepover. As per yesterday’s post Himself, Kiwi Daughter and I availed ourselves of the opportunity of eating out without “the fussy one” and later, meal enjoyed and back home, Kiwi Daughter wants to do a family activity with Himself and I. More specifically she wants to have a drawing competition. 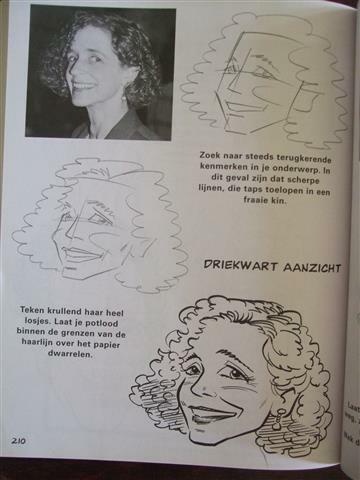 She’s got a book that shows you the basic steps to draw cartoon style figures and wants too see which of the three of us can do it best. My heart sinks: I’m a detail fanatic and whilst I studied graphic art, I hated the module we did on cartooning. We used to be set the brief: the cartoon would be judged by our use of as few lines as possible. I could never resist adding a few extra line here, there and well …everywhere. I ask Kiwi Daughter if we could maybe just draw an object in the room instead. “Later” came the reply, first a few cartoons. I explain that if you want to gain confidence as an artist then learning to “see” an object and then to transfer the knowledge of what you are seeing onto the paper is something that only practice can perfect. Copying someone else’s work doesn’t teach you the skill of how to represent something yourself. 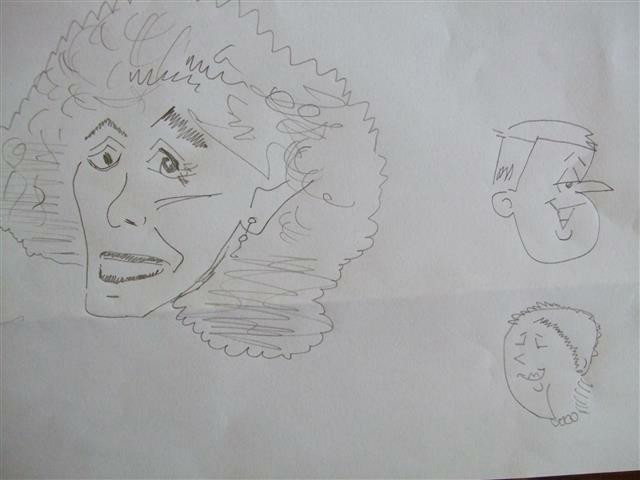 Kiwi Daughter imagines herself to be arty, but rarely practices drawing at all. ” Too much work” she says. I don’t understand this at all, if you love to draw then surely it’s not “work”, it’s pleasure isn’t it? The cartoons to be copied are chosen and we have a time limit so set to work. 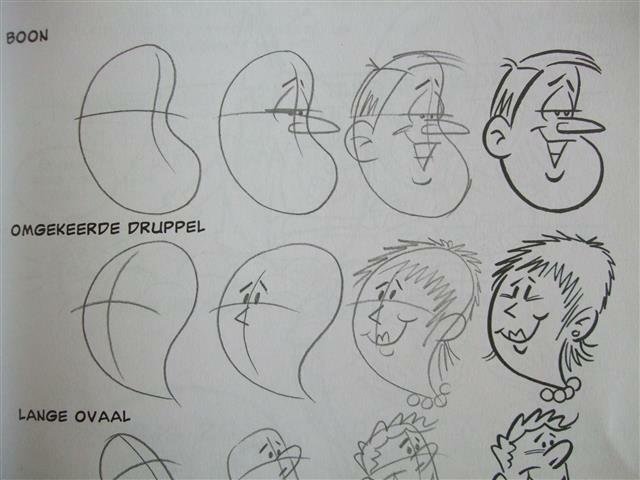 The first cartoon is a lady based on the form of an “omgekeered druppel” (upside down droplet) and the second is of a man based on the form of a “boon” (bean). I think that the results between us were very even, there were few lines and the instructions were easy. 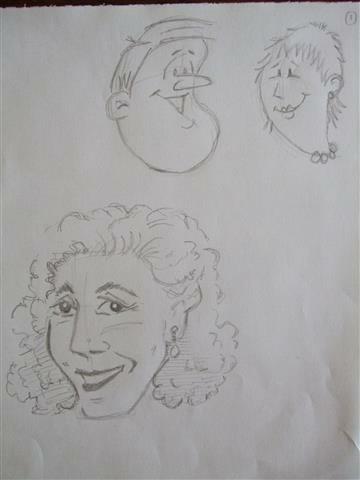 Kiwi Daughter then insisted on one more cartoon from the book, but I could choose which one. I choose a complex one because I want to get her away from her comfort zone of the most simple drawings. Kiwi Daughter quickly gives up saying that her effort looks like a robot and Himself says his looks like an angry old lady. Mine is less of a success too, I’ve made her too long in the face and not wide enough. Now we proceed to drawing something in the room. Complex items like furniture are swiftly vetoed by Himself and Kiwi Daughter who demand something really simple please… I have a box of drawing pencils, how about we each take one and draw that? In the end I’m designated as the winner, but it doesn’t really count because I studied practical art back in my school days. Last Saturday Kiwi Daughter was trying to get five subjects worth of homework done so that she could go on a sleepover at a friend’s place. For various reasons most sleep-over’s take place at our place so this was bit of a special occasion for Kiwi Daughter and she was motivated to actually try and work rather than spend the morning procrastinating. Himself was juggling taking Little Mr. to his sports game, then dropping him back home, leaving again to go grocery shopping, running errands and getting gear ready for the other activity Little Mr. attends on Saturdays. I was helping Kiwi Daughter organise herself, make sense of homework instructions and giving her examples of the maths questions and explaining the method behind them, whilst avoiding her skilful traps set to try and get me to give her actual answers to the real questions she was supposed to complete. She knew that her presence at the sleep-over wasn’t guaranteed unless she completed the work so she was really trying her best. Himself’s schedule was tight: he was to deliver two kids to two parts of the city at almost the same time as he also had an appointment to drop off urgent paperwork to a client that he’d gotten up early to complete earlier that morning. All was well until 40 minutes before Kiwi Daughter was due to be whisked out the door… she had strict instructions from Himself to be ready on time but was struggling with French. This is how I ended up busy packing her overnight things for her whilst keeping up a running debate with said child who was forcefully telling me that the French word for “school” is “collage” and who was adamant that I was sooo wrong when I told her that perhaps ” l’ école” might be a more suitable word. She reluctantly believed me when I shoved a French dictionary under her nose and jabbed a finger at the entry that showed her that maybe her Mama did possess a few working brain cells after all, and then probably as to avoid any possibility of admitting this fact, she changed the subject abruptly by telling me that today was also sleep-over-girl’s Birthday and what did we have that could be given as a Birthday gift? The short answer was a stunned “um… nothing”, we don’t just keep a supply of random gifts laying around, we usually get something specific for the someone when we have an idea of what they might want. Time was ticking away and so I telephoned sleep-over-girl’s mother and asked advice, knowing that springing another errand into Himself’s tight schedule wasn’t going to be met with unbounded enthusiasm. Luckily Himself avoided that extra stress when I was told that the Birthday Girl was saving for a week away in Italy in the Summer with her Mama and so a small amount of pocket money would be most welcome. I had a brainwave… Last year I’d bought a little die cutter that cut out shapes that folded into little boxes that looked like Pizza boxes… and I had just one of them already cut out, in a box of craft stuff stashed away. Leaving Kiwi Daughter to wade through the French dictionary on her own, I rummaged around for the box and then grabbed some thin felt pens. 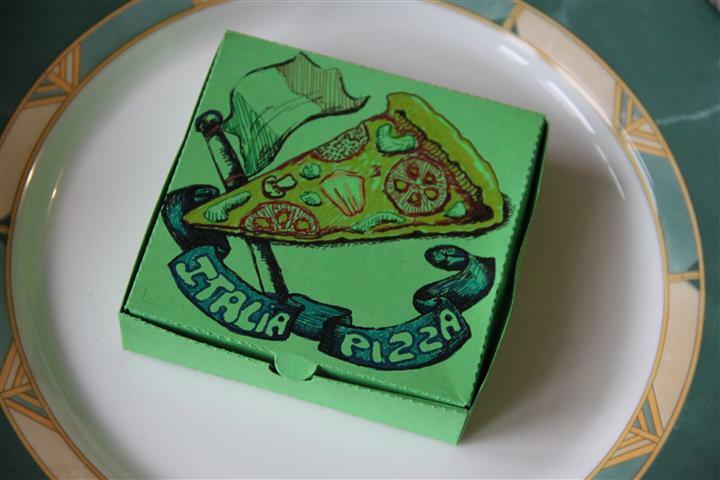 Quickly the little box gained a sketch of a slice of pizza that I filled out with the colours. I mean how often can it be is that someone posts a giraffe drawing, just short while after you’ve been asked for a drawing of a Giraffe ? Actually “ask” isn’t quite how it happened: it was more of a demand and Little Mr was in no mood to wait for patient studies and careful detail since for whatever reason, he “needed” his giraffe sketch quickly. He hovered impatiently bouncing up and down from one foot to another whilst I used Google Images and typed in “giraffe” to remember what the spots looked like (and the face and the ears and the…) and after a quick scan of the page a stubby finger went out with an order “That One!”. At least I know that Little Mr’s artistic standards are low enough that there will be no criticism. One good thing at least. The rough sketch is barely taking shape when his small voice says “finish it quick because I need to colour it in”… and this is when the truth emerges that they are due to visit the zoo and he confesses that he’s supposed to have done a drawing in his book already himself. He’s now annoyed that I did this on a piece of paper and not directly into the book. I tell him he may copy mine but that he needs to do is own homework. Himself appears and clarifies matters, it’s not homework apparently, just extra decoration and the kids could have cut a picture out of a magazine if they had wanted to. Strangely enough we do not happen to have magazines laying around containing images of giraffes. Ok, then no problem. I get arms flung around my neck in a spontaneous hug for my efforts with a muffled “Thanks Mama!” from the head buried in my shoulder. He reluctantly lets me take a photo before he snatches it away and runs off to find a glue-stick. I have a lot of admiration for CC’s artistic efforts: giraffe’s are far harder to draw than they look.